Last week I received a box of goodies from Adidas Badminton to review. Among them is a Adidas adipower pro racket. Adidas is a newcomer to the badminton equipment scene. 2+ years in the planning Adidas is finally ready to reveal their badminton lineup to the world. 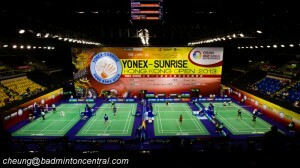 The Adidas adipower series of badminton racket is characterized by their offensive characteristics. Stiff powerful shaft combined with a head heavy feel is suitable for powerful badminton player who likes to penetrate their opponent by attacking. The adipower pro is rated as a stiff singles racket for power attacking player. The spec weight is 88g +/- 2g with a balance point of 293mm +/- 3mm. A unique reverse taper shaft (7.5mm near the T-joint tapering down to 7mm near the handle) rolled together with top quality Japanese made graphite give the racket it’s powerful designation. Adidas incorporated some unique technology for the adipower pro’s racket head. A “Dual Force Frame” consist of both titanium mesh at the 4 corners and Zylon fibers to reinforce the frame structure. Zylon is a material made by Toyobo company in Japan and is supposed to be 1.6 times stronger than Kevlar. More Zylon is strategically place around the frame as part of the adipower pro’s “Vibration Control System”. With such elaborate trove of material used in the frame I was surprised to see a recommended tension range of 20-25lbs. Surely it is capable of handling more than that but I think it is not a bad idea to be conservative for the first launch. Aesthetically the adipower pro is quite a looker with a black based color scheme with red and silver accents. The shaft is black with “adipower pro” near the cone and silvery lines running along the shaft. 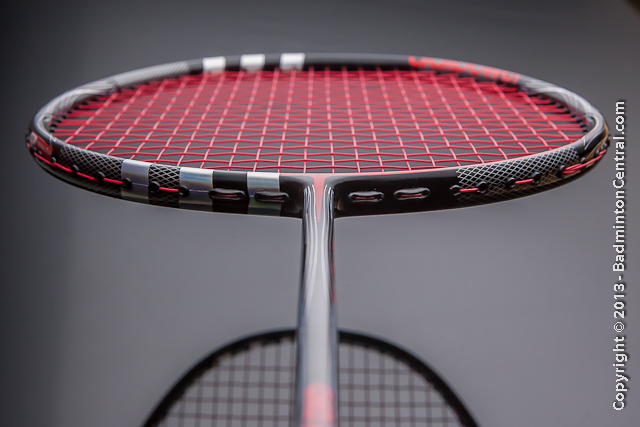 The asymmetric design of the head consist of the signature Adidas Triband in silver on one side of the racket and red accent running over the T joint and the other side of the racket. the name “adipower” occupies the top corner and the racket is finished with silvery mesh which depicts the Ti mesh embedded within. The quality of the finish is of quite high quality. The final finish is very uniform giving a high quality look to it. 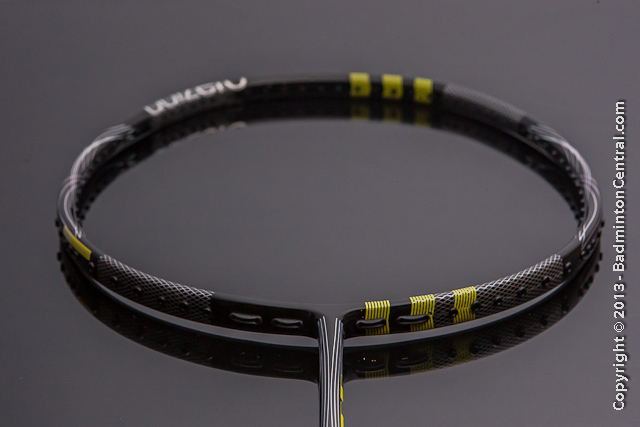 However, the design of the racket with many reflective components can pose a real challenge to the finish department. And it shows as some joint imperfections are present during the decal application of the triband area. The overall simple, bold and elegant look give the racket a classic European look and a fresh departure from the more complex Yonex and Victor design. I was so excited to try out the adipower pro it didn’t stay unstrung for very long. I tension it up with my test string Ashaway Zymax 62N @ 23/25.5lbs in red color which complements the design perfectly, making an already stunning racket even more beautiful looking. Stringing the adipower pro is a breeze esp with the help of the extra non-shared holes at 4/8 o’clock. Under an electronic constant pull stringing machine, the racket head handled the moderate 23/25.5lbs tension with ease. The frame show no signs of stress or deformation at all. However, I was a bit surprised to see some of the single pass grommet poorly trimmed and the heated flaring of the double pass grommet not the most uniform. The quality is on par with Yonex but not quite reaching Victor’s super nice shaped grommet tips. 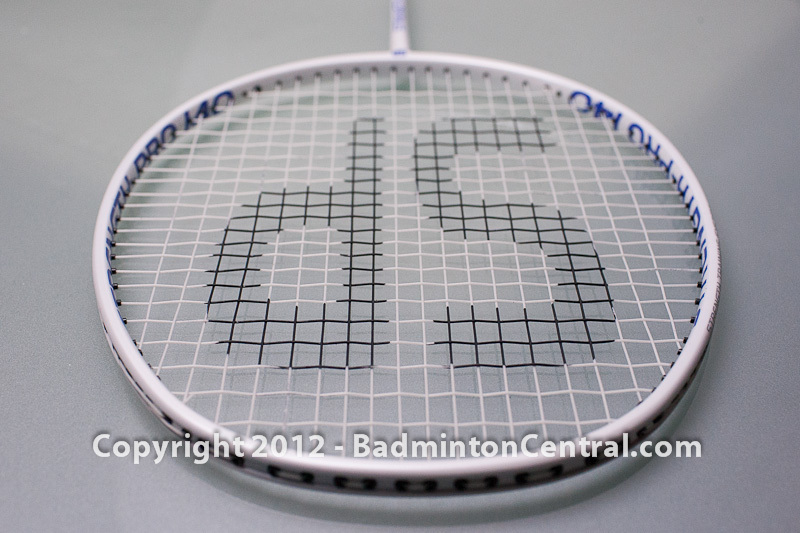 I finished off the preparation of the adipower pro and hurried off to my local badminton club for testing. On dry swings the adipower pro is a moderately balanced racket. The swing weight is not heavy nor light. It reminds me of something similar to a Yonex ARC10 or Ti10 balance, solid yet not too heavy to the hand. We started off doing some drive practice and the stiffness and speed was very apparent at first hit. By speed i don’t mean swing speed but the speed of repulsion of the shuttlecock bouncing off the string bed. A moderate flick of the fingers and wrist the shuttlecock crisply bounces off. The reverse taper design probably contribute to this liveliness feel. I am also happy to report that the racket feels very solid despite mine sitting near the low end of the weight tolerance (86.4grams). This is an indication that the raw material used is of high quality graphite as well as used generously, an important factor that separates the top quality rackets vs the wannabes. Despite being flexurally stiff, the adipower pro is also torsionally stiff. Off center hits are well controlled and deflection of the racket head is quite minimal. Onto harder shots, hitting clears continues to show the crispness of the racket, a solid hit will be rewarded with a shuttle that flies off the stringbed deep into the baseline. However, the adipower pro really shines when hitting hard smashes. This is where the stiffness is put to its best use. The harder one hits, the more the racket responses, on the hardest of hit the shuttlecock purely explodes into the opposite side of the court. Very stable and explosive. While I am not the most powerful of players, I was able to flex the shaft enough to put the racket to its paces. Esp when all factors are aligned with a full body power smash, that is where the racket is most fun. Dampening is well controlled with the adipower pro but not excessive. I would rate dampening slightly more than a typical Victor racket but less so than Yonex. I prefer rackets with less dampening to give the player a good feel and feedback on the impact with the shuttlecock. As a result, it is easy to feel the shuttlecock on delicate control shots like drop, push or netshot. Defensive shots with the adipower pro is not the best as you would expect from a weighty attack racket. The stiff shaft also reduces dwell time for inducing spin in counter attack, it demands a strong finger and wrist action to do good defense. However, all is not lost as this is a racket that is designed for singles and for faster double offensive, one can try the adipower tour or adipower duoforce which have a balance and stiffness suited for doubles defense. Having praised the adipower pro I do want to point out that there are some caveats. The adipower pro is more suitable for the hard hitting badminton players. The crispness and liveliness is nice but it take power to bring out the power of the racket, beginners might struggle wondering why their shots are not deep enough and their smashes don’t explode off the stringbed like i have described. Being a power racket it lacks ultimate maneuverability, for someone who prefers the super fast swings and lightning defense they may want to look into the adizero series instead. Being stiff also makes the racket less forgiving and demands strong skills to utilized it to the fullest. To summarize, the adipower pro is an offensive oriented racket for upper intermediate to advanced player who has the skill and power to bring out the potential of the racket. If you qualify you will be rewarded with a crisp, lively and powerful weapon in your hand. I am very impressed with the adipower pro. Solid, good feel and feedback, good swingweight and balance. I highly recommend it to anyone whose preference is a fast attacking game. The sample I received is a prototype, there are some small details like the decals and grommets which i hope will be corrected during production. This is a really strong entry by Adidas into the field of badminton, it shows from the quality of the feel and performance of the racket. With the appropriate marketing and distribution, it will for sure give the other top brands a run for their money.